Juice is obtained from fruits or vegetables by mechanical processes. It is fermentable, butunfermented, and it has the characteristic color, aroma and flavor of the fruit or vegetable from which it comes. Brix is a unit used to describe the percentage of soluble solids in e.g. a Juice. The soluble solids are mainly sugars but there are also smaller or larger amounts of acids and other materials. The Brix figure obtained by a refractometer reading is called refractometer Brix. In order to obtain the real percentage of soluble solids the refractometer Brix has to be corrected for acidity and temperature. The percentage soluble solids, i.e. the corrected Brix, divided by the percentage titratable acidity (as % citric acid anhydrous) is called the Brix/Acid Ratio or just “Ratio”. How do you use Brix and Ratio? The Brix and Ratio are criteria used to determine maturity and quality of Juice. 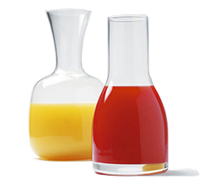 Brix is also used to determine the degree of concentration in the production of Juice concentrates. The product obtained from a Juice by the physical removal of a certain proportion of the water content. The traditional method is the heating of Juice under vaccuum, resulting in the evaporation of water. How do you make a Juice from concentrate? By adding back the same amount of water which was taken away during the concentration process. How much concentrate is needed for 1 liter of Juice? 1 liter of Juice at 11,2 Brix, e.g. Orange or Apple Juice, contains 112 x specific weight 1,045 = 117 grams soluble solids. 1 kg of concentrate at 66 Brix contains 660 grams soluble solids. To make 1 liter of Juice you need 117 / 660 = 177,3 grams of concentrate. How much Juice do you get from 1 kg of concentrate? Using the same basic values as above you will get 660 / 117 = 5,64 liters of Juice from 1 kg of concentrate.